4 oz. size shown for reference. 1 fl. oz., 4 fl. oz., 16 fl. oz. WARNING H313 – May be harmful in contact with skin. H320 – Causes eye irritation. H227- Combustible Liquid. H305 – May be harmful if swallowed and enters airways. Aves® Safety Solvent Conforms to International Safety Standard ASTM D4236. *Keep out of reach of children. Wear gloves & safety glasses. Keep container closed when not in use. Ventilation should be used. Do not smoke or use product near open flames. Simple water cleanup is recommended. Smoothing, tooling/texturing Aves® 2-part products and other Epoxies. 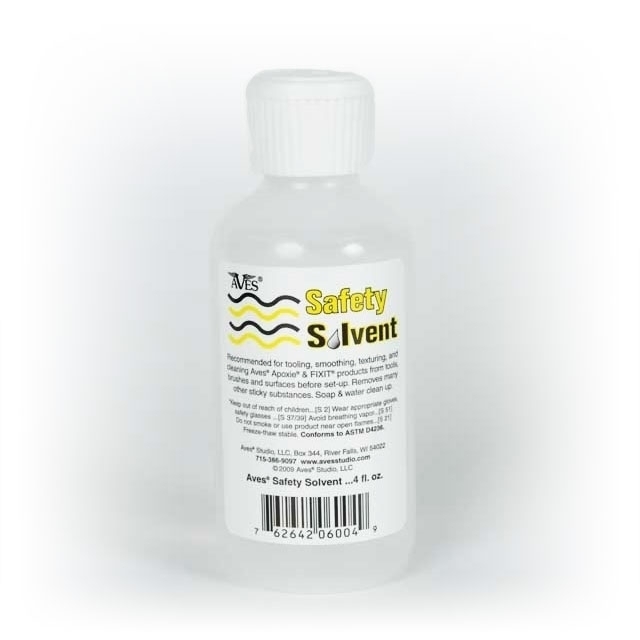 A safer alternative for acetone and other commonly used toxic solvents. Removes nearly any sticky substance! Epoxy’s before set up. Label residue, sap, tar, resins, honey!